CRUNCH CFD® has an advanced fully integrated fluid–thermal coupling capability that allows the fluid and thermal domains to run on independent sets of processors for high computational efficiency. User Defined Functions (UDF) are available to specify generalized heat flux or temperature distributions as boundary conditions. The framework has been extensively validated for heat exchangers, regenerative cooling channels for liquid rocket engines, and turbine blade cooling among other applications. 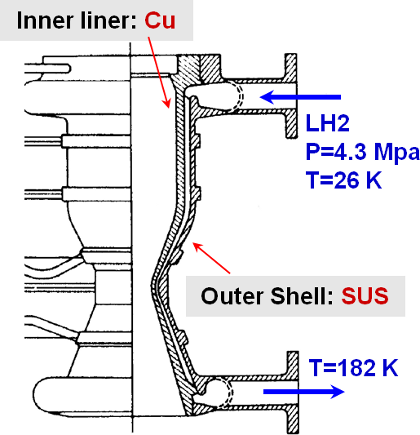 In the example shown here, a liquid hydrogen regenerative cooling channel is simulated and the heat flux at the “cold” and “hot” wall are compared with data. The chamber wall is cooled by liquid hydrogen at super critical condition. Please visit the CRUNCH CFD website for more information.